. . . outstanding performances . . . [Barenboim] provides effortlessly supportive accompaniment that moves in perfect sync with every turn that Batiashvili takes . . .[Tchaikovsky]: the way that Barenboim shapes the first phrase from the orchestral violins, delicate and tender, is just exquisite. This rapt, hushed approach to the music is echoed by Batiashvili . . . when she plays the first movement's main melody after a brief initial cadenza, it's ever so slightly slower than one normally hears, less robust perhaps and more rhapsodic, almost wistfully dream-like. It's such a beautiful moment, and truly brings out the poetry of the piece . . . There's an enormous amount of freedom and elasticity of phrasing and tempo, but it's always incredibly subtle, and it makes the world of difference . . . Barenboim gets a wonderful range of sounds from his players, bright and bold one minute, dark and husky the next. Batiashvili certainly also has plenty of chances to dazzle us with some pyrotechnics: the main cadenza in the first movement has some very impressive double-stopping and harmonics, and virtuosity abounds in the tremendously exciting last movement . . . [Batiashvili gives a commanding interpretation of the Sibelius Violin Concerto,] but at no point does it ever feel stale . . . the very opening of the piece is as extraordinary as I've ever heard it: remarkably eerie and yet hopeful at the same time. The way she spins a phrase is quite something, momentarily withholding vibrato to highlight the bleakness of an unexpected sharpened fourth, and then injecting just the right amount of warmth a few seconds later. It's most enchanting and sets the tone for a stunning performance. These are both unbelievably impressive accounts of two cornerstones of the repertoire, and it's been a delight to listen to them. Naming the soloist on the last concerto recording you heard is probably easy. But can you name the orchestra? On this disc, there's no danger of forgetting that it's Daniel Barenboim's Berlin Staatskapelle; the quality of the orchestral playing, the warmth and depth of tone are constant reminders . . . [Tchaikovsky]: [Batiashvili is] a dreamy-sounding, inward soloist at the start, shaping the melodies with care yet propelling them forward -- this mammoth work has rarely seemed so concise. The Sibelius soars and sings in the first movement, and dances in the finale with a rare agility. As for Barenboim, he gives the orchestral parts the depth and scope of symphonies: the climax of the first movement of the Sibelius will knock you flat.
. . . [Batiashvili and Barenboim] sound fine here, especially in the first movement of the Tchaikovsky . . . Barenboim and his splendid orchestra -- arguably better these days than the Berlin Phil -- accompany attentively, and DG's recording is first class. Giving a music lover for Christmas Barenboim the pianist and Barenboim the conductor, will bring much joy. This CD testifies yet again to Barenboim's accomplishment and versatility.
. . . stunning performances of two staples of the repertory . . . Her technical perfection and glorious tone are always apparent, and she is given sterling support from the fine orchestra and conductor Daniel Barenboim . . . Audio is excellent and perfectly balanced.
. . . [Tchaikovsky and Sibelius] provide the perfect foil to Lisa Batiashvili's thrilling, soaring accounts of two of the most familiar concertos in the violinist's repertory, following every twist and turn of her solo line and adding real symphonic weight to the tuttis. This album nails its colours firmly to the mast at the very beginning of Tchaikovsky's concerto. Barenboim and his German band set the scene in an opening phrase of such peace that we feel in solid company at the outset of a firmly epic journey . . . [Batiashvili] is a full and equal partner. Her playing dials down rhapsody and whimsy, instead sustaining long melodic lines with a determination that patience and calm will reap their rewards . . . [I] found myself completely entranced . . . Batiashvili and Barenboim turn a barn-burner into a soulful symphony with obligato violin . . . [in the Sibelius] the orchestra sounds magnificent, rich and dark-hued, with a grainy quality . . . This is concerto-playing of the very highest order from Lisa Batiashvili and Daniel Barenboim. Every familiar phrase somehow manages to sound both authoritative and newly discovered. There is no violinist currently playing the high end of the international circuit that I would sooner go out of my way to hear than Lisa Batiashvili. There is something so super-intuitive about her playing that, while she is performing, the brilliance of her technique, the range of her colours and the sheer invention of her phrasing are subsumed into the intrigue (there seems to be no other word) of her musical storytelling . . . Everything feels "in the moment", a quality of improvisation like music created in the playing of it . . . What strikes me (and indeed surprised me) more than anything about this popular coupling is the distinctive character that she and her seasoned collaborator Daniel Barenboim find for both pieces . . . The Tchaikovsky exudes a melancholic warmth fusing classical and romantic sensibilities . . . The first statement of the first subject is tender and understated, the second a little more persuasive, but never is the poise and purity of Tchaikovsky's innate classicism compromised . . . for all the colour and invention of Batiashvili's playing it is never, ever self-regarding . . . Batiashvili's tempo for the finale is on the articulate side of dashing, with nimble footwork and pyrotechnics that have shape and agility, not just crowd-pleasing brilliance (though that is, of course, there in spades) . . . and the passage in harmonics just before the home stretch brings Barenboim's limpid Berlin woodwinds deliciously to the fore . . . [with the Sibelius] Batiashvili homes in here on the ethereal quality of the lyricism. The beautiful opening theme at first seems indivisible from the oscillating icy haze of the orchestral violins and maintains its mystery . . . That quiet intensity is maintained throughout achieving an extraordinary other-worldly quality in the recurring passage . . . But equally Batiashvili is tuned in to the inherent wildness in this music . . . The intensity that is so darkly expressive in the slow movement finds release and later abandon in the sometimes insane passagework of the finale . . . So a disc full of beautiful and inventive violin-playing from one of the world's most mesmerising talents. You can never second-guess Batiashvili, and that in part is what makes her so perpetually fascinating as a musician. Few violinists today play with Batiashvili's combination of remarkable technique, tone quality, maturity, and expressiveness . . . DG has given us near-definitive recordings of the Tchaikovsky and Sibelius violin concertos . . . [the Tchaikovsky Violin Concerto] comes up fresh and consistently engrossing in this new recording. Batiashvili has no trouble with any of the formidable technical issues, nor does she try to do anything radical in the way of interpretation. The finest artists, one might note, seldom change tempos, dynamics or phrasing in strange ways; rather, they get to the heart of what the composer intended with an accurate rendition of the score. A case in point is the solo section between the two big orchestral tuttis in the first movement. Batiashvili finds a light-hearted dance quality in the music that I had never noticed before. It is charming and sounds absolutely right . . . [Barenboim] insists on accuracy, beauty of tone, and careful attention to balances from his musicians. The result is a classic interpretation of the Tchaikovsky Violin Concerto. Similarly, in the Sibelius Violin Concerto, these artists are not interested in showing off, but rather, in getting to the heart of the music, which they do, as few performers have done before them. One feels confident that Batiashvili will not only hit all the right notes, but also that she will respect the composer's wishes. Although necessary, accuracy and a faithful reading of the score alone can be deadly dull. Batiashvili is never dull. Her tone is pure, but inflected with subtle variations that render the music consistently expressive. She also knows how to build climaxes with carefully modulated increases in volume. In Barenboim and Staatskapelle Berlin, she has a conductor and orchestra willing and able to provide the most sensitive accompaniment imaginable, as well as enormously powerful orchestral climaxes when required. Great sound from the DG engineers. Like the Tchaikovsky -- a classic performance. Lisa Batiashvili need fear no comparisons. Her playing is beautifully refined and note-perfect, without seeming soulless. She performs with total assurance, as if she has all the time in the world to colour a note or inflect a phrase. Barenboim and the Staatskapelle Berlin support her well, and the recording sounds smooth, open and very natural, with a good balance between soloist and orchestra. Dynamic range is impressively wide and the level of clarity is excellent.
. . . [Sibelius]: brilliant . . . The first thing that strikes you is the beautifully rich, deep recorded sound that DG have managed to conjure up for the recording. The airy opening of the Tchaikovsky concerto is delightful when the violins introduce the first idea, and you're almost taken aback by the strength with which the cellos and basses come in to answer. This then builds to a wonderfully rich first climax that precedes the soloist's entry, and when Batiashvili enters she instantly marks herself out as someone worth paying attention to . . . gently, cautiously, curiously, as though she is feeling her way through it. It's a magical opening, and the songful lyricism of the second subject is every bit as fine, gently yet confidently sliding its way from one phrase to the next, eventually soaring on high with the finest cantabile quality . . . Barenboim and his orchestra are on great form, too . . . While the Tchaikovsky concerto is very good, however, the Sibelius is something rather special. It's a concerto I have often struggled to love, but this recording not only made me rate the performance but rank the work more highly in my estimation . . . This disc speaks of a great and evidently successful partnership between conductor and soloist, cultivated over several years and bearing rich fruit. This is definitely worth exploring, even if you have several recordings of both concertos already . . .
Two greats, performed by two greats.
. . . [the first movement of Batiashvili's Sibelius is] lyrical, sweet-toned, and flowing, so you feel the impact of her artistry . . . She's not out to prove that she's in command of the music but rather that she's intimately merged with it. For sheer beauty of tone Batiashvili has few rivals . . . beguiling . . . Barenboim and his Staatskapelle Berlin provide gilt-edged accompaniment . . . Together, the interpretation they devise for the slow movement is reflective rather than wrenching . . . [in the finale,] Batiashvili's amazing technical resources take center stage . . . her reading of the solo part is captivating . . . [in the Tchaikovsky] her musicality and beauty of tone make a strong impression. She's meditative in the slow movement, achieving an inward poetic effect . . . The finale, taken at speed, brings out the evenness of her technique in all phases . . .
Lisa Batiashvili's sparkling set of the Sibelius and Tchaikovsky violin concertos really shines in the 96khz/24bit download, with the orchestra and soloist captivatingly balanced.
. . . [Batiasvhili offers] real individuality in the Tchaikovsky. And an equal partnership with Barenboim is paramount. The unique Staatskapelle sound is an additional attraction here. But if this is excellent, the Sibelius -- a key work in the violinist's career -- is quite magnificent . . . every tiny detail registers with such musicality.
. . . impressive . . . [the Tchaikovsky Concerto is] a performance that eschews emotional hyperbole, focusing instead on poetic intimacy, most obviously manifested in the deeply thoughtful way Batiashvili shapes the warm-hearted melody in her opening entry and in the stunningly beautiful return of the same idea from the Berlin Staatskapelle's principal flautist . . . Batiashvili's lyrical playing in the Allegro moderato and Canzonetta gives way to a more extrovert display of virtuosity in the Finale . . . Batiashvili and Barenboim offset this exuberance with a wonderfully sensitive approach to the more reflective passages . . . This remarkable partnership of musical minds also excels in the Sibelius, the glacial opening passage in the first movement being especially hypnotic . . . Barenboim and the Berlin Staatskapelle really come into their own, delivering playing of devastating power . . .
. . . exceptional. I love the fluidity of Batiashvili's playing, and her expression too . . . she has impeccable clarity and her intonation is just extraordinary. Barenboim, meanwhile, really understands the structure of a piece and how it works as a whole. A dazzling disc . . .
. . . performances of enormous maturity and originality . . . [well supported] by Daniel Barenboim's fine Staatskapelle Berlin forces . . . [the] concertos once more made the impact that their composers must have envisaged.
. . . majestic . . . Batiashvili invests Tchaikovsky's heart-felt inspiration with an enhanced range of dynamics, tonal colours and expressive inflections. She also takes a little extra time to relish passages of derring-do bravado -- as witness the first movement cadenza . . . [Batiashvili's performance] possesses a noble sincerity, enhanced by Barenboim's devoted support.
. . . [Batiashvili offers] real individuality in the Tchaikovsky. And an equal partnership with Barenboim is paramount. The unique Staatskapelle sound is an additional attraction here. But if this is excellent, the Sibelius -- a key work in the violinist's career -- is quite magnificent . . . every tiny detail registers with such musicality.
. . . a superb coupling of the violin concertos by Tchaikovsky and Sibelius . . .
. . . some fabulous solo playing and very fine accompaniment . . . [a] very fine DG recording, with ideal balance between soloist and orchestra.
. . . un programme très séduisant dont la haute valeur dérive directement de la connaissance qu'on les interprètes des partitions, de leur complicité . . . C'est surtout dans un premier temps, à la suite d'une écoute première, le Concerto de Sibelius qui affirme une saisissante compréhension musicale. D'abord le Concerto de Tchaikovsky . 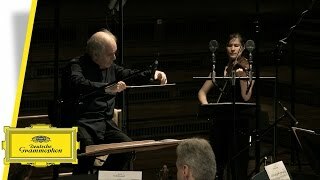 . . Belle urgence du premier mouvement où l'orchestre de la Staatskapelle de Berlin, l'orchestre de Barenboim, sonne avec une élégance de ton d'une irrésistible séduction: le préambule est idéal pour l'éloquence feutrée de la sublime Lisa (Batiashvili), violoniste attachante . . . ondine serpentant dans un paysage orchestral superbement suggestif: la direction du chef éblouit par sa réserve caressante et détaillée . . . [Batiashvili's articulation d'une grande finesse exprime une] élégance lovée dans l'orchestration de Tchaikovsky . . . Si le Concerto de Tchaikovsky affirme une virtuosité flamboyante, l'opus de Sibelius s'inscrit dans l'énigme et le scintillement d'une enivrante fragilité. Le premier mouvement est d'une bouleversante confession elle aussi filigranée qui exige des instrumentistes, soliste et musiciens de l'orchestre en présence, un sens de l'écoute et de l'équilibre global, . . . idéal, magicien. Le son de Lisa Batiashvili se révèle d'une rare incandescence, immédiatement solaire . . . Nous tenons là l'une des meilleures versions récentes du Concerto de Sibelius: scintillements de l'orchestre, chant intérieur, déchirant du violon soliste. Magistral. [Sibelius]: La violoniste témoigne ici d'une richesse de phrasés uniques, et dans l'immense premier mouvement articule chaque phrase sans oublier la grande forme ni la nécessité de varier les couleurs. Barenboim lui offre un orchestre sombre, qui rappelle le noir des couches rocheuses de la région d'Helsinki. Le Tchaikovski demeure dans la même veine, une absence de brillance absolument virtuose, pour un maximum de sensibilité. Une vraie réussite . . .
Lisa Batiashvili, très engagée, exacerbe la vivacité des tempos, réussit les articulations savantes voulues par les deux créateurs qu'elle défend en produisant de très belles couleurs et en affrontant idéalement les tensions exigées par eux. La Staatskapelle Berlin superbement et précisément conduite par Daniel Barenboim atteint des sommets interprétatifs . . . ils lui dressent un écrin orchestral idéal pour servir son timbre chaud et précieux, pour amplifier ses lignes mélodiques franches et ses élans rythmiques sensuels et implacables. Un enregistrement hautement recommandable. Que ce soit dans Tchaikovski ou dans Sibelius, Batiashvili et Barenboim visent une saturation harmonique maximale et des sons très nourris . . . Beaucoup de son, avec des moments violonistiques d'une extrême beauté, à l'image de la tenue et de l'intensité de la chanterelle dans la cadence du premier volet du concerto de Tchaikovski . . . l'indication moderato revient fréquemment dans l'Allegro initial et elle est observée avec zèle! La Canzonetta est à l'avenant, rêveuse . . . Tout cela est splendide, et plus raffiné que véritablement vécu. Sibelius, plus crânement empoigné que Tchaikovski, captive globalement davantage . . . Si vous aimez le luxe instrumental [l'acquisition peut se justifier] . . .
Lisa Batiashvili and Staatskapelle Berlin under Daniel Barenboim’s baton present an unforgettable version of Tchaikovsky’ and Sibelius’ violin concertos, two of the most beloved, passionate and demanding pieces for violin and orchestra.